Cbet nr. 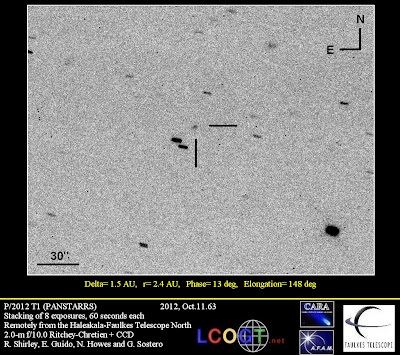 3252, issued on 2012, October 11, announces the discovery of a new comet (discovery magnitude 20.7) by Pan-STARRS survey on CCD images obtained with the 1.8-m Ritchey-Chretien + CCD on October 06. 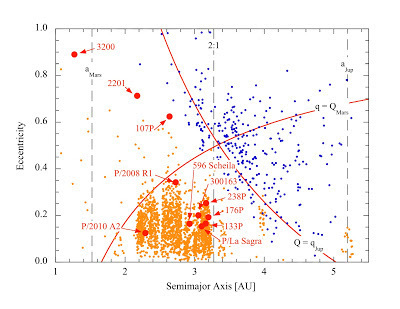 Prediscovery Pan-STARRS observations from 2011 July 28 were identified by G. V. Williams. The new comet has been designated P/2012 T1 (PANSTARRS). After posting on the Minor Planet Center's NEOCP webpage, other CCD astrometrists have also commented on the object's cometary appearance. 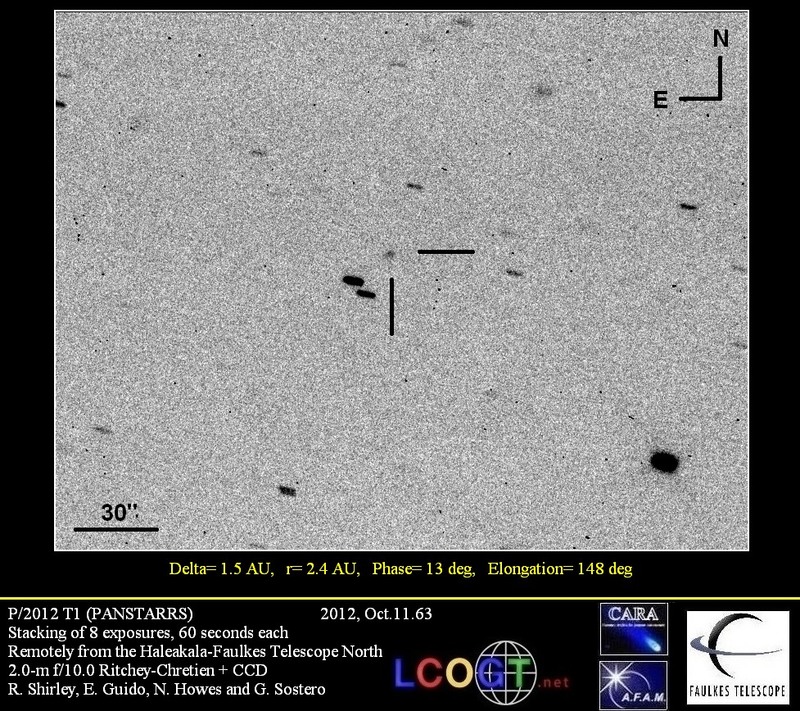 We performed some follow-up measurements of this object on 2012, October 11.63. Stacking of 8 R-filtered exposures, 60-sec each, obtained remotely, from the Haleakala-Faulkes Telescope North through a 2.0-m f/10.0 Ritchey-Chretien + CCD, shows that this object is a comet with a faint coma nearly 5" in diameter. 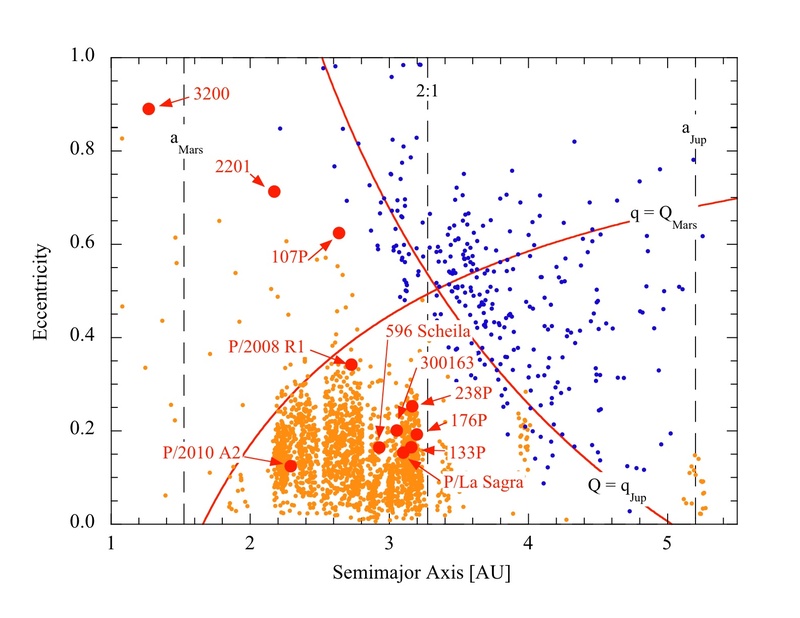 Below is shown the distribution of the mass-losing asteroids, including their relation to the asteroids (orange dots) and classical comets (blue dots). In this graph the position of newly discovered P/2012 T1 (PANSTARRS) is just nearby 300163 (2006 VW139). Click on the image for a bigger version.